The Microsoft SharePoint Team Blog (http://blogs.msdn.com/b/sharepoint/archive/2010/09/21/security-advisory-2416728-vulnerability-in-asp-net-and-sharepoint.aspx) lists WORKAROUND steps that should be taken for SharePoint Web Front Ends (WFE’s) to mitigate the vulnerability related to ASP.NET. Follow the link above to find the steps for your version of SharePoint and implement this in your environment. It only takes a few minutes! I am running a clean install of MOSS 2007 SP2 on Windows Server 2008 R2, all patches/updates etc. have been applied (this was not an upgraded SP2003 server). This should be filtering such that I import only people with the account type of User, which are not disabled, and do not have a blank value listed in Company. What I get: SOME disabled accounts are imported into the User Profiles and appear in the User Information list, while others are not. This is happening AFTER 3 or more Full Imports have run since the time the user accounts were disabled in AD. All of the accounts are ‘disabled’ the same way in AD, right-click and choose disable. Looknig at the menu via right-click on the account displays “enable” and looking at the properties shows that the accounts are disabled. After searching and trying various things I did find one very interesting thing. When the import is run using the domain administrator account rather than my SharePoint service account (which has read access to the AD) then all of the disabled accounts filter properly. When I switch back and do a full import, then the rogue disabled accounts return to Active. It is always the same accounts that do not filter and the same disabled accounts that do filter regardless of the user who runs the import. There must be some kind of permission thing going on here, and I am still testing but this seems like an odd behavior that may have as its source Active Directory. Updates to follow, if I ever find the final answer. I had a group come to me recently that wanted to set up a subsite to their site and allow a group of users create sites under that subsite. Standard issue for SharePoint. In this case they wanted those sites to all start out the same. They had specific things such as two document libraries and a few other specific lists as the default when those sites get created. Also standard issue for SharePoint…by simply creating a site template the users to select they would get what they wanted. To make everyone’s life a little easier I decided to restrict the subsites so the users could only use the template created for them. The group manager was very happy-this made it very simple for them to find and thus the creation of their sites was a snap. The trick to it all is getting to the Page Layout and Site Template Settings page. This isn’t available to you at the Site level, it is only on the Site Settings menu at the Site Collection level (top-level site). That doesn’t mean you can’t use it to accomplish this task. Make your adjustments to the site templates available to subsites in the Page Layout and Site Template Settings screen, then click OK. There are lots of blogs out there talking about the problems people have setting up SSO (Single Sign On) in SharePoint 2007 implementations. There are also quite a few that run down the steps to do it and state that it is easy. What is the disconnect between these two “camps” talking about SSO setup? Well, one thing (IMHO) is that the ease of the process depends on YOUR environment and YOUR knowledge of what SSO is, how it works, and what you plan to do with it. So my first (and most important) tip is take the time to learn about SSO and what you want to accomplish by using it before you attempt to configure it. The Account Type selection of Group is used when you want to connect to the data source using the same account for all users in the designated AD group. Search is really one of the most needed, if not most important, components of a corporate intranet based on SharePoint. Why? Because if you can’t find what you are looking for on the intranet, then the intranet is of little value. Regardless of whether or not you accept this concept as true, the fact is that improving the search capabilities of your SharePoint farm will increase usage and acceptance. One of the things you can do to improve the search capabilities of your SharePoint farm is to make some (or all) of your site columns searchable in an Advanced Search page. I know, I know, you can already find content based on the data in your site columns when searching now. But how many documents are in your result set? And, can your users search for specific site column content? If you have created Content Types and Site Columns that your users understand, then they will likely want to search for specific content based on them. Here are the steps to take to enable searching directly on your custom site columns from an Advanced Search. I created a new Advanced Search page, you could modify your Search Center Advanced Search page if so desired. To search by a column in any list or document library, you need to create a managed property and modify an Advanced Search box…and you will need to crawl your content to make it available. So let’s get to it. My example is using a Site Column named “Product Name”. 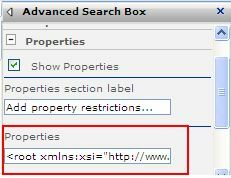 We are halfway there, we now have a managed property that can be accessed by the Advanced Search web part. To enable users to search for the column from the UI, you have to add the new property to the property drop-down in the Advanced Search web part they use. Again, this can be any advanced search web part, however this only enables the web part you modify. If you want users to select this property from any Advanced Search, you will have to modify each of them. Now your savvy users can search for content with laser accuracy and obtain search results that focus on what they want without having to sift through extraneous results. The new SANSPUG (San Diego SharePoint Users Group) is growing fast, and it was apparent at the August meeting held this week. There were only a couple of empty seats and those in attendance engaged in many discussions and gained valuable tips on SharePoint. The first session presented by Galen Keene on “Being a SharePoint Site Collection Administrator” was well received. Galen did a great job of running down all of the menu items available to a 2010 SCA by keeping it informative, interactive and NOT a boring lecture just listing the menu items. Kudos to Galen, especially considering this was his first user group presentation! Chris Givens followed with an interesting session on “Using SharePoint Content Types Properly“. His session included some live demo’s hosted on the SANSPUG.org SharePoint site. Having a SharePoint 2010 site available to the user group proved its value tonight. This informative session sparked discussions that intrigued everyone. Chris adjusted on the fly and displayed live on the SP 2010 site several things people were asking about and seamlessly went right back on track with his presentation. Excellent job Chris! I think everyone learned something at this meeting, and seemed to enjoy both sessions. We wrapped up with announcements about upcoming events that are in the planning stages, such as a SharePoint Exam Cram, a SharePoint Sprint, and a SharePoint Saturday in San Diego! The San Diego SharePoint Users Group holds monthly meetings that are FREE to anyone interested in SharePoint. The group has two levels of membership, a basic member just like any other user group and the other a paid member who desires access to additional (“Premium”) content and activities. To learn more about upcoming meetings and events check out the www.SANSPUG.org site. Registration on the site is free, which provides access to meeting presentations and more.